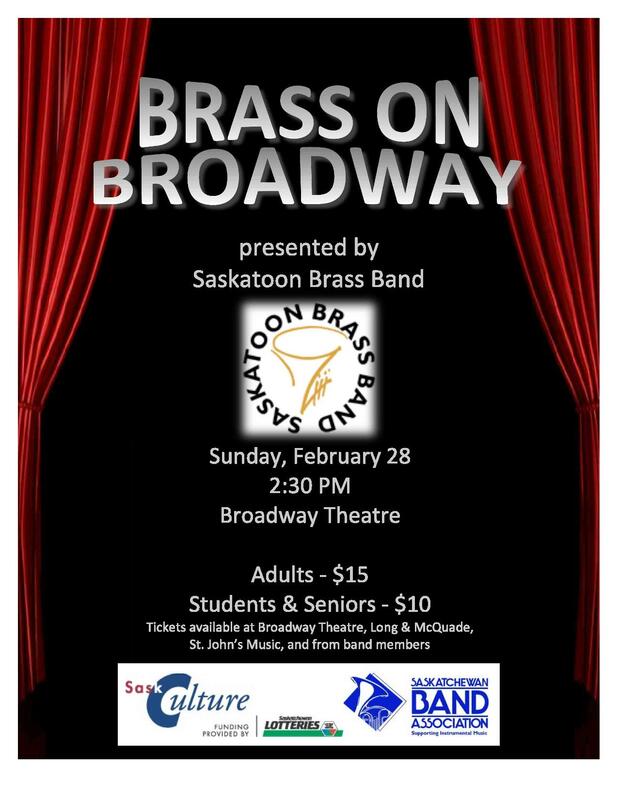 Brass on Broadway – Concert opportunity this coming Weekend! This is a great chance to see live music and also for seniors students to complete concert review for this term. Tickets are available online at the Broadway Theatre website or on the door. The band will be performing hits from the most successful Musicals and shows to hit the broadway stage including music from Phantom of the Opera, Wizard of Oz, Riverdance, the Sound of Music and many more. With the upcoming Canadian Rocky Mountain Festival performance looming the senior Band will be focusing their preparation and there are several extra rehearsals for the event. March 18th – Tentative Afternoon/Early evening rehearsal with West Seniors and Attending University of Saskatchewan Wind Orchestra Concert. Students will be bused to and from the event. You need a health card and parental/guardian permission for any photography that happens during the Resonate event. Alternatively bring a signed release form (handed out on Monday) to school on your next band day with your health card number to sign up in class. I hope everyone is refreshed from February break! Just a note to remind everyone division rehearsal is on this week and attendance is very important with upcoming festival and tour season approaching. Information about Optimist Festival and more tour information and fundraising will appear imminently this week. Following up on all information given to students. All PSSD Clarinet players have been invited to the first ever Klarinet Kerfuffle on March 19th at the University of Saskatchewan. This will be a hugely beneficial event to attend, to meet new people of your same age and ability, work with some of the provinces finest Clarinetists and also improve your playing and knowledge of your instrument. The deadline to apply is This coming Friday. Please see the below details and get signed up! 1. When is Klarinet Kerfuffle? – Saturday March 19 – 8:45 a.m. – 5:00 p.m..
4. How do we register? – print the registration form (attached), fill it out and mail with a cheque payable to Saskatoon Concert Band to the address on the form. 5. What is Klarinet Kerfuffle? – KLARINET KERFUFFLE is a full day of activities for clarinetists and bass clarinetists of all ages. Each student will participate in clarinet and/or bass clarinet workshops and a student clarinet choir or ensemble, and will be treated to recitals of solos and small ensembles. The day will end with a final concert featuring Reedy Set Go! and the student ensembles. There will also be displays of clarinets and clarinet accessories provided by local musical instrument dealers, and door prizes. 6. Students in our band program start in grade 5. Can they attend? – Yes. If your program starts in grade 5, let us know and we will place your students in the appropriate class. 7. Who will be performing and teaching the students? – Performers and clinicians include over 20 of Saskatoon’s finest adult clarinetists and bass clarinetists, including at least 7 current or former members of the SSO, and members of four of Saskatoon’s adult community bands. The performers and clinicians have over 500 years combined experience playing and teaching the clarinet! KLARINET KERFUFFLE is presented by Saskatoon’s clarinet choir, Reedy Set Go!, the Saskatoon Concert Band and the University of Saskatchewan Music Department. Sponsors include the Saskatchewan Band Association, Sask. Culture, Sask. Lotteries, Musicraft Instrument Repair, St. John’s Music, and Long & McQuade Musical Instruments. Band teachers are also welcome to register and attend. The event poster, registration form, and schedule are attached to this email as pdf files. Please distribute information and the forms to your students and encourage them to attend. For more information, contact klarinetkerfuffle@gmail.com . Event: Resonate Student Music Conference – 50% full – Sign up now! The 2nd ‘Resonate’ music conference will take place at Cedar Lodge (Blackstrap Lake) from April 14-15th and is open to any students, with or without previous music experience in grades 7-12. The course is already 50% full so please see the links below to sign up yourselves as soon as possible from home or contact Mr. Martin/Mr. Ward or your school admin team for more details. If the numbers of students in each school is large bus transportation might be provided to and from the event.